Winter is coming to its end and spring will emerge again and this means most families are eager enough to get outside together and enjoy the open spaces and fresh air of the natural world. Not only is it refreshing, but it’s also an important part of a child’s development to come into contact with the world of plants, trees and animals as much as possible. If you’re not sure what kind of outdoor activities there are for you and your family to enjoy together this spring, then take a look at these 5 great ideas that are sure to be fun for all. Garden treasure hunts: This takes a little effort from the grown-ups but is a massive hit with the kids and is a lot of fun for the grown-ups to watch take place. Plan a garden treasure hunt, hiding clues around the garden and scattering prizes along the way. Prizes could be things like sweets and chocolates, or could be natural objects that look pretty likes stones and feathers which your child can keep as mementoes afterwards. Fishing: This is a timeless classic, and many families still enjoy fishing trips every year. Going fishing and gets your kids outdoors in spring .They will have the chance to learn about what lives under the water. Many kids find this especially fascinating, as they usually don’t get to see fish up close. Visit a petting zoo: Everybody loves cute baby animals, so Spring is the best time to bring your kids for a visit to the petting farm. Your kids will see by themselves the animals that farmers raise, get them to learning about the process of the whole farming while getting up close and personal with the animals themselves. A little lamb, a calf or some tiny fluffy chicks are sure to impress your kids and put big smiles on their faces. 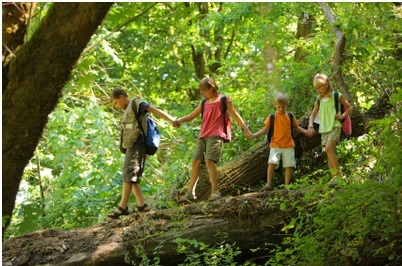 Camping: Another classic outdoor activity for the family is camping. Camping is a lot of fun and also really educational for kids. They get to enjoy being outdoors while learning about the natural world, as well as picking up some camping lessons along the way. Camping is also fantastic for family bonding with everyone sat around the camp-fire enjoying food and fun together. Grow plants: Spring is the time for new growth, so why not take advantage and teach your kids something about it? Growing flowers is a great way to teach kids what spring is all about, and watching a plant grow and eventually display a pretty flower can be very satisfying as well as educational for your child. You can even lend the project a further useful dimension by growing herbs instead – using them in your cooking shows kids something about where their food comes from.